Every woman is different, so no two shoots are ever the same. My cozy private home studio is located in Shamong, NJ. I offer a variety of backdrops that can take your shoot from light and airy to dark and sultry. It all depends on what you are looking to do for your custom designed shoot. We will schedule a time to talk, either by phone or Skype, to discuss exactly what you envision for your portrait session. We will chat about outfits, backdrops and the overall feel of your session. 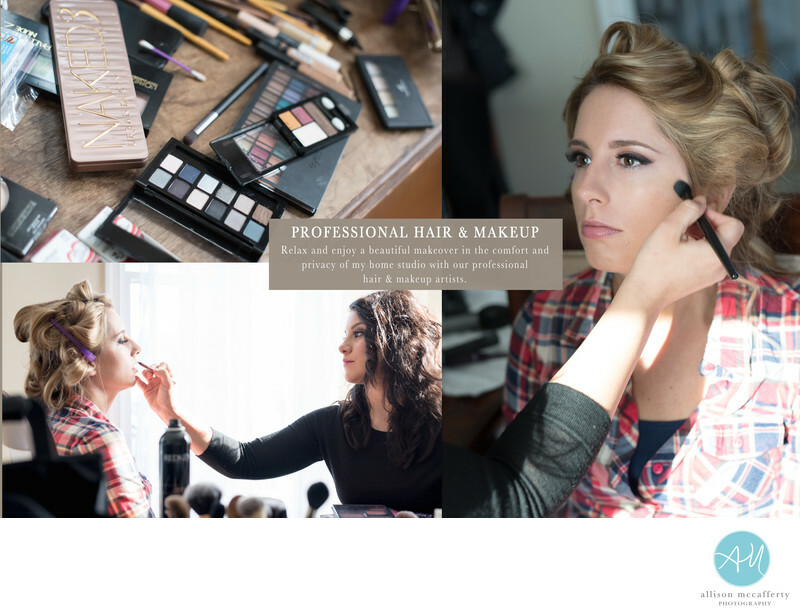 Professional hair and makeup is done on site by Meghan Jester. Her work is flawless and perfect for my style of glamour and boudoir photography. I understand that getting in front of the camera can be a nerve wracking experience. It is natural to feel a bit nervous or uncomfortable when you come in for your shoot. Throughout your portrait session I will guide you in pose, positioning and expression that will yield absolutely stunning images. Your artwork is printed on fine art canvas stretched around a full hardwood frame. I don't want my photos online, are they kept private? All images are kept 100% private and secure. Your online gallery is password protected. Any photographs you see online are of models and clients who have given my studio written permission to share. To see more of my glamour and boudoir work, please check out my portfolio here. 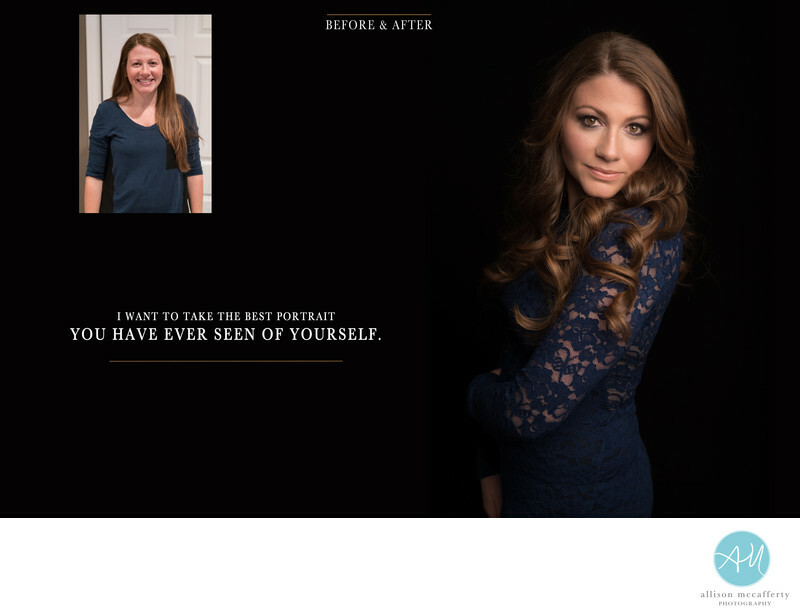 Your images will be ready for viewing 60 minutes after your session. Grab a bite to eat or relax in the studio while I edit your images and come back for your in-person image selection and ordering session. The $350 session fee is required to reserve your studio time as well as a signed contract. We will set up a call to discuss your shoot prior to you arrival. Yes! There are a couple ways you can finance your purchase. 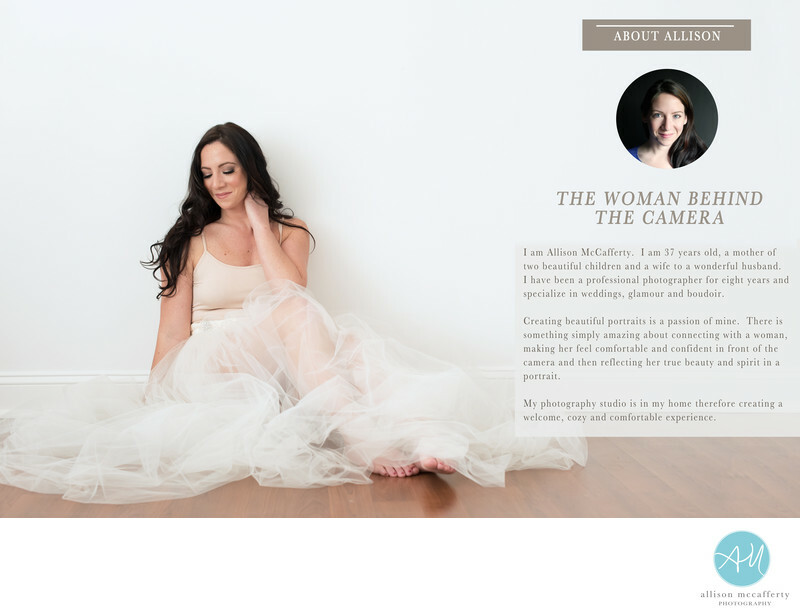 A Payment Plan through Allison McCafferty Photography. This payment plan is interest-free, but products are not delivered until the order is paid in full. You will need to pay a minimum deposit of $100 when you place your order and agree to a monthly payment that is comfortable for you. Product orders $500 I offer up to 6 months financing. Orders over $1000, up to 12 months financing. PayPal Credit (Most Popular Option). Please feel free to email or call me at 609-440-4148 with any questions. I'd be delighted to set up an in person or Skype meeting as well.